Forensic engineering involves seeking the cause of structural failure. Structural failure does not necessarily mean that collapse occurs but can involve the failure of structural materials. Examples where we have given advice include collapses during underpinning, collapses consequent upon vehicle impact, damage by water inundation and collapses due to structural abuse. 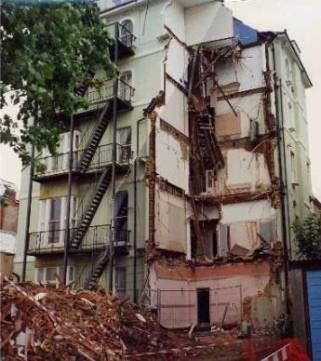 A block of flats in Eastbourne where there was a partial collapse. We acted on behalf of the insurance company to ascertain the probable cause of the collapse based upon the evidence available. Alterations had been carried out prior to the collapse.